“I am confident that we can reach an agreement to avert any escalation of violence,” Martin Griffiths, the UN Secretary-General’s Special Envoy for Yemen said, according to a statement issued in Amman to the media. Fighting between Houthi rebels who control the city, and government forces backed by a Saudi-led military coalition, has put lives of hundreds of thousands of civilians there at risk. Martin Griffiths was in the Yemeni capital, Sana’a, at the weekend, for talks to try and resolve the crisis. 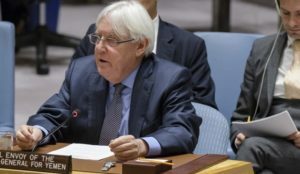 “My priority now is to avoid a military confrontation in (Hodeida) and to swiftly return to political negotiations,” he said, according to the statement. She reported that one quarter of children there are suffering from acute malnutrition, while the city was an epicenter of last year’s deadly cholera outbreak, among the worst in recent history. “Of all the things we are worried about, cholera is top of the list,” she added. Written by: KanelkaTagba on June 22, 2018. Posted by KanelkaTagba on Jun 22 2018. Filed under Headlines, World News. You can follow any responses to this entry through the RSS 2.0. Both comments and pings are currently closed.